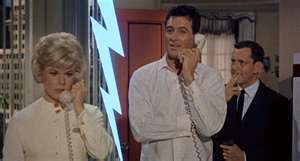 Delbert Mann’s Lover Come Back stars Doris Day & Rock Hudson. It was the middle of three movies the pair made together. The first was Michael Gordon’s Pillow Talk two years earlier, which won the Best Original Screenplay Oscar; and their final collaboration, the brilliant Norman Jewison’s Send Me No Flowers followed it three years later. The late, great Tony Randall (Felix Unger of TV’s The Odd Couple) co-starred in all three. Stanley Shapiro & Paul Henning were nominated for Best Original Screenplay for Lover Come Back in 1962 at the 34th Academy Awards, losing, in a good decision by The Academy, to the legendary William Inge for Splendor in the Grass. Lover Come Back is the quintessential romantic comedy. Neither Jerry Webster nor Carol Templeton, Madison Avenue advertising executives for different companies, ever intends to fall in love with the other. They don’t like each other much, especially Carol. She thinks Jerry is crude & selfish & manipulative. She’s right!! There’s the standard mistaken identity that’s seems to be part of most romantic comedies of the era, but Mann’s technique is for Jerry to pretend to be Nobel Prize Winning Chemist Dr. Linus Tyler in order to seduce Carol & plagiarise her marketing ideas. Dr. Tyler, played marvelously by Jack Kruschen, is an old friend of Jerry’s whom he needs to invent Vip, a product that doesn’t exist but for which his firm has been selling a lot of advertising. 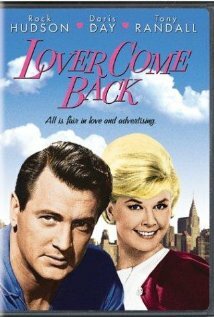 When Lover Come Back was released in 1961, television was becoming incredibly popular in middle class America, similar to the smart phone craze today. The cast of the movie reads like a who’s who of 60’s TV shows. 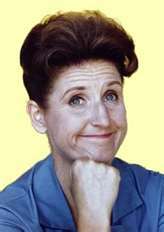 Besides Tony Randall & Doris who had her own show, watch for: Ann B. Davis – the Brady Bunch’s maid Alice, Joe Flynn – Captain Binghamton on McHale’s Navy, and Donna Douglas – Elly May on The Beverly Hillbillies. 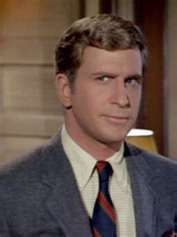 And even Ted Bessell, Donald on That Girl, makes an appearance as an elevator operator. As in any good romantic comedy, love triumphs – despite Jerry’s deception & theft of Carol’s intellectual property. Lover Come Back is a cute & joyous movie rarely matched in the genre today. It’s a bit anachronistic, as you’ll see in the sweet morality of the end scene, which seems out of place now given our knowledge of Rock Hudson’s homosexuality & untimely death due to AIDS. Delbert Mann’s Lover Come Back is a really cute, family fun film. Rent it & enjoy with your spouse & adolescent kids. They’ll think you’re a VIP. Preston Sturges’ The Lady Eve, starring the Henry Fonda at 35 and Barbara Stanwyck, beautiful & 33, is a fun & flirty romantic comedy. Fonda plays Charles “Hopsi” Pike, the wealthy scientist son of an ale baron en route to New York City on cruise ship after a year in the Amazon studying snakes. Stanwyck is Jean Harrington, the card hustler partner of her father the Colonel (Charles Coburn), who plans to fleece the naïve ophiologist during a few nights of poker on the cruise. Instead, of course, she’s snake bitten & soon all-in for love. 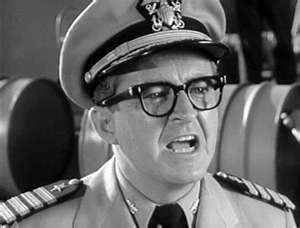 Fine performances are turned in by all three, as well as William Demarest (Uncle Charley in My Three Sons) who plays Pike’s suspicious bodyguard/valet, Muggsy. As expected with romantic comedies, there are a number of twists & turns and mistakes in identity (although in this piece they’re planned when Jean Harrington disguises herself as the British aristocrat, Lady Eve). Sturges represents the era quite well in the light & enjoyable The Lady Eve, a very good if not great motion picture. 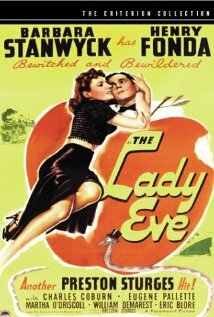 In 1942, at the 14th Academy Awards, The Lady Eve was nominated for the now defunct Best Story Oscar. The award was to honor the person who wrote the original piece upon which a films adapted screenplay was based. 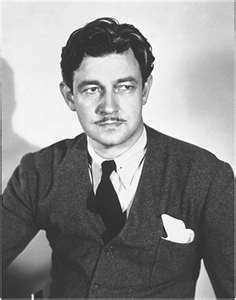 The Nominee was Monckton Hoffe, and the story was based on his 1922 play, The Faithful Heart. In 1994, the U.S. National Film Registration Board entered The Lady Eve into the National Film Registry. And all five of its principals are Academy Award Winners or Nominees: Sturges, who is most celebrated as a writer, won the Best Original Screenplay Oscar the year before for The Great McGinty; Fonda received an Honorary Oscar in 1981 at the 53rd Academy Awards, and the following year was Best Actor for his unforgettable portrayal of Norman in On Golden Pond; and that same year, his Lady Eve received her Honorary Oscar; Coburn won the Best Supporting Actor Oscar for his role as Benjamin Dingle in The More the Merrier in 1944 at the 16th Academy Awards; and Demarest was nominated for Supporting Actor in ’46 as Steve Martin in The Jolson Story. 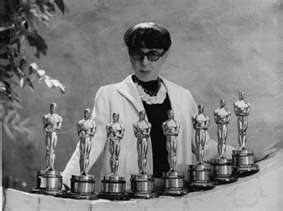 Eight-time Oscar Winner, the incomparable Edith Head, was the Costume Designer for The Lady Eve, and the costuming, while not given any awards, is fantastic. It was her first of many collaborations with Stanwyck. They were not only colleagues, but good friends. Edith even designed some outfits for Barbara’s personal wardrobe. Her beautiful design of the wedding dress for the film was such a sensation that it was copied & became a popular choice for brides of the time. It was known as The Lady Eve Dress. The Lady Eve shows that True Love conquers all: she rights wrongs; turns scoundrels to saints; and crosses societal barriers. She will not be denied irrespective of the passage of time – even if she needs to execute devious plans to have her way. And if you’ve been smitten by her once, you know her. True Love is the same to you & I as it was to Jean & Hopsi: Whether you’re rich or poor, a scientist or a hustler, a snake or a thoroughbred, a valet or an aristocrat: “She’s the same dame!”. Michael Curtiz’s Night and Day – a rare treat that requires some searching through libraries to locate on DVD – is a fictionalized biopic of the late, great Cole Porter’s life as a Yalie through the height of his career in the 20’s & 30’s, and concluding around the time the film was released in 1946. It’s worth noting that two of Porter’s most successful projects, the Broadway productions Kiss Me Kate and Can-Can (he wrote the lyrics & music for both), were released subsequent to the film & so are not covered in Night and Day. Both were later released as Oscar Nominated films. 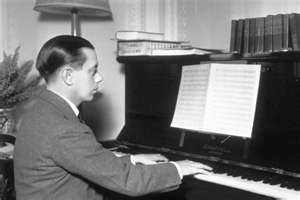 On October 24, 1937, Cole Porter, a longtime equestrian, received compound fractures to both of his thighs from a horseback riding accident that left him permanently disabled. His genius is evident by the staying power of his great tunes, many of which are included in Night and Day. Besides the title song, the soundtrack includes Anything Goes, Let’s Do It, I Get a Kick Out of You, I’ve Got You Under My Skin, and Begin the Beguine. This is the earlier of two Cole Porter biopics. It stars Cary Grant who is, as usual, great. The other, Irwin Winkler’s De-Lovely was released in 2004 & won Kevin Kline a Golden Globe for the performance. That the latter was released almost 40 years after his death speaks mountains of Porter’s music. Both films are excellent! 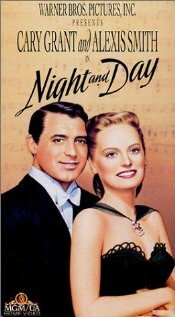 Night and Day is arguably the better of the two, having earned Ray Heindorf & Max Steiner an Oscar Nomination for Best Score for a Musical in 1947 at the 19th Academy Awards. It is, however, a sanitized depiction of Cole Porter’s life. 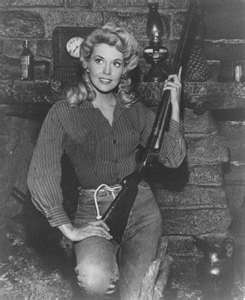 Because of the movie censorship rules at the time, his open homosexuality & platonic marriage to Linda Lee are omitted from the film, perhaps accounting for the Rumor – That Wingless Flyer – that Porter disliked the film immensely. Or perhaps it’s because the film is so fictionalized: It opens in 1914 with Porter leading & playing piano for the Yale Repertoire Company Orchestra, when he was actually at enrolled in Harvard Law School. There’s a modicum of critical detraction over the casting of the suave, British, Cary Grant as Cole Porter. But it’s important to remember: Night and Day is not a documentary! 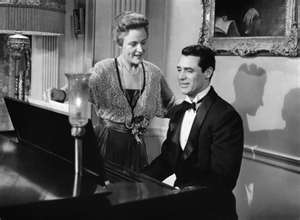 And reportedly, the composer was pleased with the casting & said, “If they wanted Cary Grant to play you in a movie, would YOU complain?”. You may recognize Night and Day’s director, Michael Curtiz. He’s best known for some crappy romance set in Morocco during World War II starring Humphrey Bogart & Ingrid Bergman. Let’s see…what was it called again??? Oh yeah, that’s right, 16th Academy Award Winner for Best Picture, Director, and Adapted Screenplay: Casablanca. Curtiz, Gary Grant, Heindorf & Steiner: Night and Day has pedigree. The DVD isn’t available from Blockbuster nor is the film for streaming on Netflix. But if you like Cole Porter’s music – and who doesn’t – it’s worth searching online to find a local library that has it & taking a quick trip to borrow it for a Night and Day!